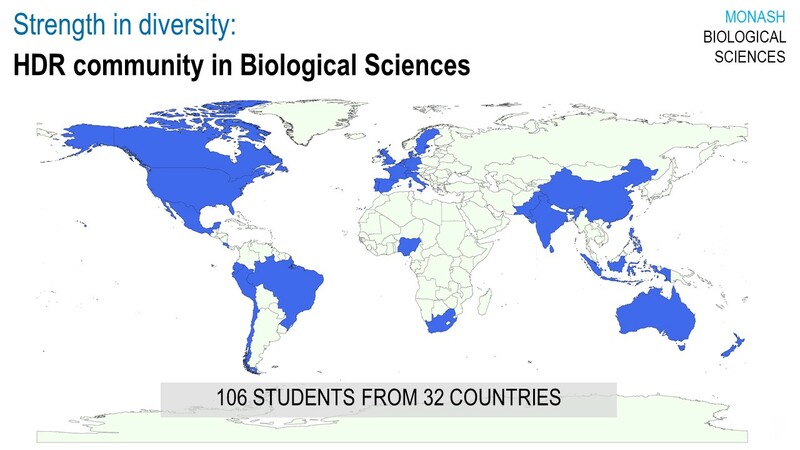 The School of Biological Sciences has a large and dynamic postgraduate community with students drawn from a wide range of nationalities, cultures, and backgrounds. This creates a productive scientific environment as well as an active social atmosphere. Through a range of academic events and social activities, our PhD program and community of postgraduates encourage friendly interaction, collaboration, respectful debate, and scientific excellence. See a list of our current PhD students. The School offers postgrads numerous opportunities to present their findings and discuss their research interests. Within the School, joint discussion groups help facilitate academic debate outside of each individuals’ own research group. As part of our School's Seminar Series, postgrads are invited to meet with speakers from all around the world, enabling quality time with visiting researchers. Once a year, a Postgraduate Student Conference is held to showcase the interesting and diverse research of our postgrads, with the plenary speaker chosen by the students themselves. Presenting at international conferences is also encouraged, and travel grants are available to help students attend their conference of choice. A vibrant postgrad community helps create a warm and welcoming social environment, whether you are a student from the local area or someone who is visiting Monash from afar. With help from the elected Postgraduate Committee, the School supports a range of social activities including weekly social evenings, a yearly camping trip, and trivia and movie nights. More details can be found on the community's Facebook page. Information Guide for new PhD students. Jake Barber, PhD student with Dr Mike McDonald. Marion Bichet, PhD student with Dr Jeremy Barr. Mairi Hilton, PhD student with Dr Carly Cook. Hamdi Jama, PhD student with Dr Francine Marques. Hanna Rosinger, PhD with Dr Kay Hodgins. A 2018 survey assessed student employment outcomes for PhD students who graduated from the School of Biological Sciences between 2002 and 2018. The survey asked whether students gain employment, what sort of roles they go into and how long it takes them to find a job. This survey found that 96% of students found employment after their PhD, with an average time to employment of less than 3 months. Most students went on to further research through postdoctoral fellowships (44%) and many of those in industry or non-government roles were also conducting research (19%). Other students gained jobs in government agencies (9%) or as teaching or research assistants (10%) or as science communicators (5%). A total of 5% were employed in unrelated fields, and 3% went on to further study.